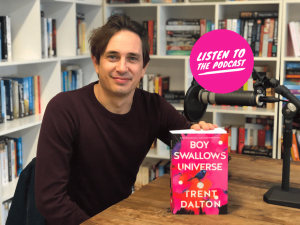 This week Cheryl is joined by Trent Dalton to discuss his debut novel Boy Swallows Universe – an utterly wonderful novel of love, crime, magic, fate and coming of age, set in Brisbane’s violent working class suburban fringe. Together they talk about Trent’s past, and the experiences that led to him becoming a journalist searching for answers and truth. I read your book over two days- and I have two young kids! I found it so moving. I was totally transported into the worlds created by this magical author. I was so impacted by the prose at one point I stopped reading to find out – who is this author who can create like Ben Okrie? I used to dream of writing a book like this – thank you for bringing it into this world.